Bead Bai is released by CreateSpace and Amazon. You can purchase directly from either one. You can also get a copy through your local bookstores if you place an order. I will continue to post more information, pictures and links. If you have family stories to tell about Bais in the dukas, please write to me. I look forward to share stories from all communities not only Ismaili Khojas. Although I write about Ismaili Khojas (because I grew up in the community), you will find the book speaks to a wider Asian African people. We can work out how your stories can be shared and remembered. If your family traded in beads in East Africa, I would like to mention the names of your grandmothers and great aunts and thus document their work for posterity. You can read the conversation on this book below under comments. As of today, there have been over 20,800 pageviews. In a survey 164 out of 165 marked YES they would buy the book when published. Thank you all for your interest and patience. Please do write a comment or two when you can. My heartiest congrates to you on the Bead Bai. Even looking at the extracts, I felt the warmth, the gentleness as well as the inner conflicts that must have so churned her. As for the people of the Savannah, what wonderful and warm, if not open, at least undercurrents that so touched the two cultures, so distant yet, in and with the thread of beads, so close and interwoven. congratulations for your fine work. I too have read Bead Bai in bits on the blog and loved every episode. God willing. I shall at last be going to Vancouver next month and will meet up Sultan and look at his book together to do up a review in some serious journal. That kind of work just should not be ignored by reading people. 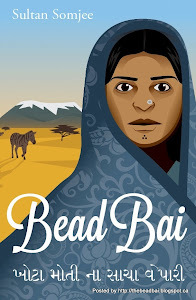 I too have read Bead Bai in bits on the blog and loved every episode. God willing, I shall at last be going to Vancouver next month and will meet up Sultan and look at his book together to do up a review in some serious journal. That kind of work just should not be ignored by reading people.